Many of the “non-traditional” takes on Valentine’s Day wedding inspiration go for dark and moody, almost Gothic feeling, so we wanted to pull together a board that felt a bit more modern and classic. We love this for a February wedding as much as we do for an al fresco reception in the summer! Yes, your main wedding color can be black – we promise! Bring it in through table linens, paper – black invitations with gold foil, or black place cards with gold or white calligraphy – accessories, and so on. We love the black candles in the top left photo, which, when paired with the rest of the decor, couldn’t be further from a Halloween-type look. 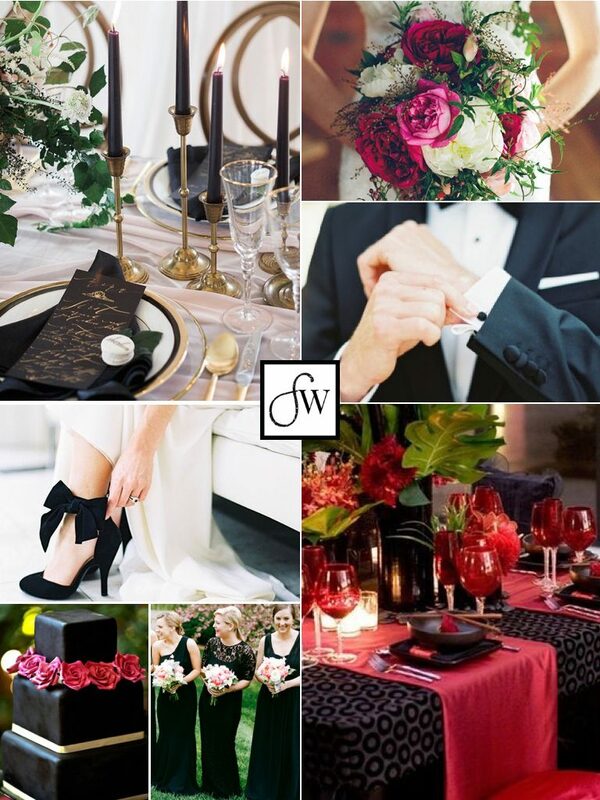 If you’re feeling bold, you might opt for a black wedding cake, as in the bottom left photo. The dye required to get a properly dark cake is likely to come off on lips and teeth, however, so keep that in mind if you’re interested in a black cake. A possible work-around – white buttercream that’s covered in Oreo crumbles, or similar? With black taking center stage, black tuxes for the groom / groomsmen would look terrific, as would long black dresses for bridesmaids. The juxtaposition of black with the dark pink and berry shades, plus the green accents, make the overall effect feel lush, but still elegant. We’d opt for texture rather than pattern to avoid veering into Kate Spade territory (unless that’s your dream look, in which case, have at it! But that’ll be a different board). Love color? The tablescape in the bottom right (our original inspiration for this board) is the place to start – the vivid pink runners, red glasses and flowers, and oversized greenery make a huge visual impact. If that’s more than you want, start with the top left tablescape, instead. The white and blush flowers could easily be accented with some darker colors, as in the top right photo. Are you planning a Valentine’s Day wedding? What colors did you choose? Let us know in the comments!